They still can have happy time when fighting cancer. We endeavor to make those moments warmer and nicer. Every person’s birthday has special meaning. We understand that suffering from cancer is painful and we would love to express our best wishes to you on this special day. In order to treat NGUYEN VAN DA , the 4 year old patient with rhabdosarcoma, his family has incurred huge debts. The whole staff of the hospital contributes positively, to support the family and try to prolong the little patient’s life with our limited ability. Wang Jingwen, the 9 year old Chinese patient with leukemia whose mother was diagnosed of breast cancer while her father’s legs were broken; the whole family was suffering from disease. Our volunteer and little Jingwen tried to help her family to go through this difficulty and organized the soybean milk charity sales for finance support. Your children may be far away in your hometown. However, you have us to be with you. 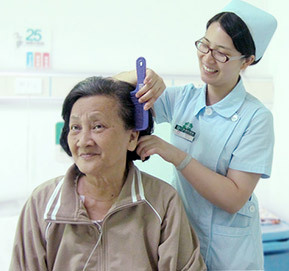 Let us comb your grey hair and fight against cancer together with courage and spirit. Let us surround you with love, have you felt the sweetness on this special birthday? 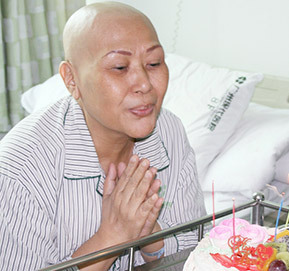 Though your hair dropped due to cancer, you are still the most beautiful lady on this special day. Do you like the birthday cake and our wishes? May all your wishes come true! Music is able to heal hearts. Whether soft or light music, it can make people feel the beauty of life. 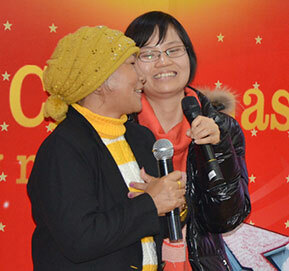 We hold singing contest each year to invite patients and their families from different countries. 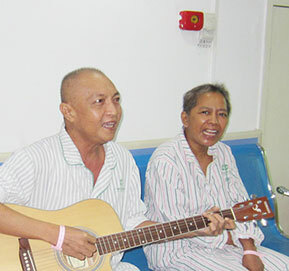 Patients encourage and cheer each other with music which is without borders. 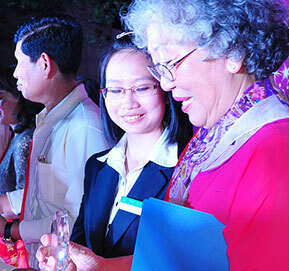 Oct 18th, 2013, we held Modern International Friends Singing Contest. 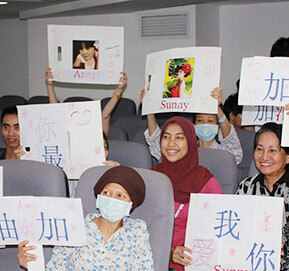 40 foreign patients and their families gather together because of music. More than 10 contestants from Guinea, Niger, Egypt, Congo and Hungary showed their talents on the stage. Christmas is a time of gaiety for family gathering. 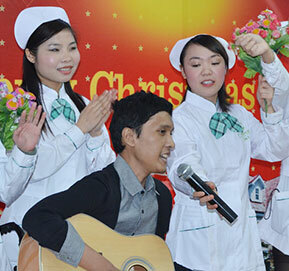 In this big family, we also held a Christmas party for international patients. And our mysterious Santa Claus sent happiness and laughter to every patient who is far away from their hometown. On Lesser Bairam, we celebrate this holy festival with all the Moslem patients and their families. 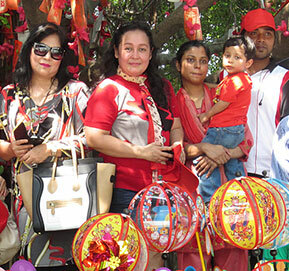 Flowers, foods and gifts make this festival full of joys. Every person dressed up and exchanged greetings with each other. How time flies! 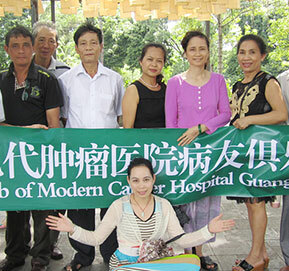 Modern Cancer Hospital Guangzhou has gone through ups and downs for 8 years. During last 8 years, thanks for your company! We received the most sincere wishes when celebrating with you on the 8th birthday! With the near year’s coming, the blessing comes too! 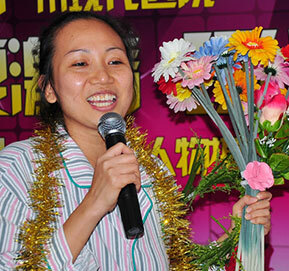 Beautiful ladies, please accept this Chinese “Blessing “, wish you good luck for the entire life. Let’s pray for love. Every red ribbon sends the message of their miss and wish to their families with the respect and hope for life. 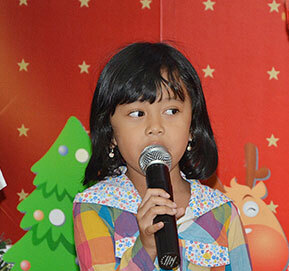 On Dec 24th Christmas Eve, little foreign patient was singing with deep feeling. She has the gift of singing and her voice touched every person present. We celebrate every patient’s birthday with love and care. Seeing your smile is our biggest wish. Moon festival is a traditional Chinese festival means family union on this day. Let us be with you on this special day. Treatment may be bored and tiresome, but music is a medium to fly your hearts. Your positive and strong mind is the most powerful weapon to fight against cancer. On Dragon Boat Festival, we eat zongzi. Small zongzi, deep love. 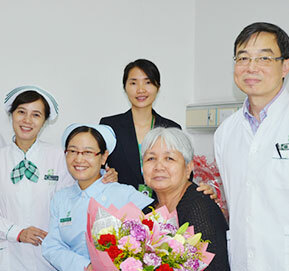 Wish every patient in Modern Cancer Hospital Guangzhou has beautiful mood. Flowers match beautiful lady! Though BERNARDITA has grey hair, her strong mind towards cancer makes her a beautiful and respectable lady. “Go, go, go, we love you! “During the singing contest in 2012, we were moved by the enthusiasm from overseas fans. 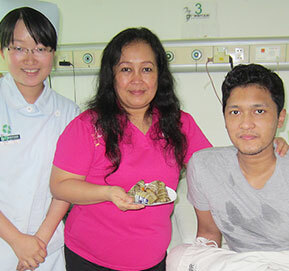 Ms. INDAHWATI JUTIAMI, who is from Indonesia, was taking treatments positively after being diagnosed of breast cancer. She is a real Anti-cancer warrior and we awarded the Anti-cancer Warrior Commemorative Medal to her. AHMED SAVERO MEDRAVADIA, a patient from Indonesia whose legs were amputated due to the osteosarcoma. However, he showed his strong mind and positive attitudes towards disease through his singing. 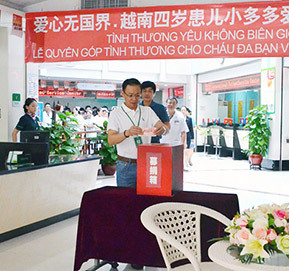 In the Patients Club of Modern Cancer Hospital Guangzhou, patients will not feel lonely any more as they are not alone! Besides us, there are also many wardmates with the same disease to unit and fight against cancer together with you.